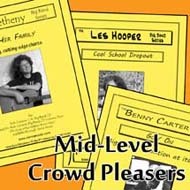 Festival 3-Chart Program - "Mid-level Crowd Pleasers"
These 3 charts make up an excellent jazz festival program! While they are not too difficult to play, the writing is exceptional. Each chart provides for a well diverse program that is achievable by mid-level bands and enjoyable for all audiences. A great, swingin' chart to end your set with, this Benny Carter tune (as recorded by the Count Basie Orchestra) will infect your audiences to tap their toes and bob their heads from beginning to end! There is solo space for tenor and piano, with incredible ensemble writing that culminates in a smokin' shout chorus. This piece is very playable (trumpet to high C, only) and makes for a great addition to this festival set.